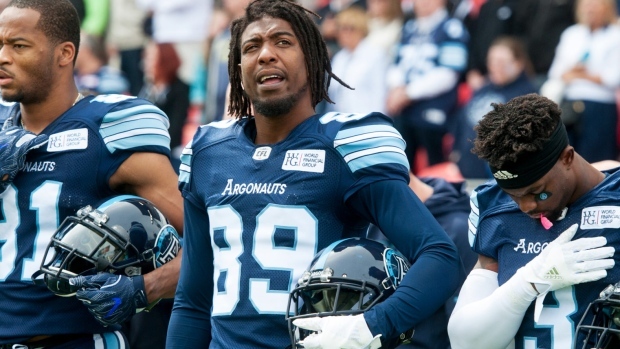 Count new BC Lions wide receiver Duron Carter among those who strongly support the Canadian Football League possibly lowering the ratio rule. Debate surrounding the rule change first arose after Justin Dunk of 3DownNation reported on Saturday that the CFL and the CFLPA are “in favour” or reducing the ratio, which currently mandates that seven of a team’s 24 starters on offence and defence must be national players, down to five players. According to Dunk, the subject of the ratio being lowered was discussed by both sides during recent collective bargain agreement negations in Toronto. Since the report, Carter and many other players have taken to Twitter to chime in on the possible change. The international wide receiver has made it pretty clear on Monday that he very much hopes the ratio will be lowered. The two-time CFL All Star took particular issue with former national CFL player Ricky Foley’s defence of the ratio. Carter also doubled-up by tweeting that Foley was “lucky” that the ratio rule was in place, suggesting that Foley wouldn’t have played in the CFL if the rule were not in place. A potential change to the ratio is obviously a hot-button topic, and it's got players from all around the league weighing in. I say reduce the ratio by 1 max. This is the "Canadian Football League" so I believe having canadians on the field is important. That being said we do need to invest more in the development of young Canadian players. weren’t you an nfl reject too? Stop it. Cfl isnt even a Canadians first choice league. I don’t care about ratio whatsoever. Have as many Canadians as you want but if he is a backing me up at my position. No way he should be making more than me. Period. No other league does that. Following Dunk’s report on Saturday, CFLPA executive director Brian Ramsay took to Twitter to call the report “completely and utterly false, and simply untrue” in a series of tweets. According to TSN CFL Reporter Matthew Scianitti, the next round of CBA discussions between the CFL and CFLPA are taking place today and tomorrow in Calgary.